Apherusa glacialis in situ in sea ice. 2:06 p.m., Sept. 13, 2012--With sea ice in the Arctic melting to record lows in summer months, marine animals living there face dramatic changes to their environment. Yet some crustaceans, previously thought to spend their entire lives on the underside of sea ice, were recently discovered to migrate deep underwater and follow ocean currents back to colder areas when ice disappears. 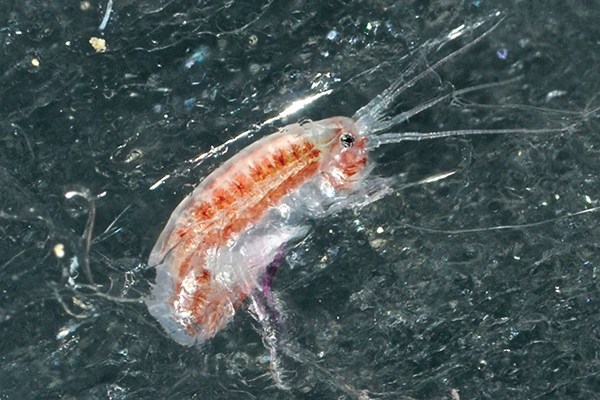 Moline, Jørgen Berge of the University of Tromsø and Norwegian colleagues found the crustaceans, specifically amphipods Apherusa glacialis that resemble small shrimp, well below sea ice during a rare winter, nighttime research expedition to the Fram Strait and Eurasian section of the Arctic Ocean. They determined that the crustaceans migrate downward as part of their life cycles and ride deep-ocean currents toward the North Pole. The crustaceans’ travels appear to be an adaptive trait that both increases survival during ice-free periods and enables them to be retained in the Arctic Ocean. The scientists refer to their findings as the “Nemo hypothesis,” based on an analogy to the Disney movie Finding Nemo in which Nemo’s father uses deep-ocean currents for transportation. In a similar mechanism, Arctic crustaceans detached from melting sea ice move into depths where the northernmost branch of the Gulf Stream System effectively transports them back into the Arctic Ocean. Previously, these organisms were generally considered to be passively exported either out the Fram Strait or down to inhabitable depths when released from melting sea ice – either of which would be life-threatening outcomes as they lost the habitat on which they depend to survive. From an evolutionary perspective, the migration may be an adaptation that allowed survival in a more seasonally ice-covered Arctic, as experienced several times during the last 12,000 years. Some reports indicate that the Arctic Ocean lacked summer sea ice as late as 8,000 years ago. The findings may help explain how ice-associated organisms can survive in large populations in the Arctic when their habitat is annually reduced by up to 80 percent in the summer before re-forming in the early winter. The article was published in Biology Letters online on Sept. 12. The work was funded primarily by the Research Council of Norway, with support for Moline provided by the U.S.-Norway Fulbright Program through his role as Distinguished Arctic Chair.